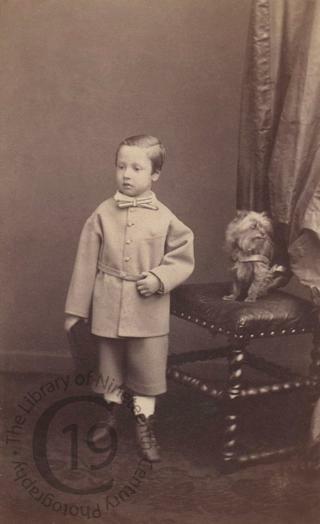 A carte-de-visite portrait of Prince Léopold of Belgium (1859-1869), Duke of Brabant, the short-lived son of Leopold II, King of the Belgians. The dog seen here on the chair next to him is presumably the same family pet that appears with the boy’s father in a portrait by François Deron. At the time of young Prince Leopold’s birth in 1859, his father was heir to the throne. When his grandfather, King Leopold I, died in 1865, his father became king and young Prince Leopold became heir to the throne. Prior to his grandfather’s death, young Leopold held the title Count of Hainaut. When he himself became the heir apparent, he became the Duke of Brabant. Leopold died at Laeken or Brussels on 22 January 1869 from pneumonia, which developed after he fell into a pond. His father the king was inconsolable, collapsing to his knees at his son’s funeral and sobbing uncontrollably beside the boy’s coffin. Photographed by Ghémar Frères of Brussels.